I followed this instruction for a time, before other concerns crowded in. This week, though, I have been given a number of reminders. Psalm 139 was part of the Sunday lectionary. It also came up in daily reading. At here, where I am on retreat, it was read to our group as the introduction to a workshop. In my naive faith, I see this as God’s not so subtle way of reminding me to pay attention, to lean into this truth, even and especially at times when it seems hard to believe. Yesterday I had a strange sense of falling apart and being held and healed all at the same. This was neither a part of the conference agenda nor was it a conscious part of my own agenda. I went for a long prayer walk in hopes of getting past this. No such luck. But I was given the image of a piece of yarn catching on something so that the fabric of my identity, of my life unraveled, even as I moved forward. I was powerless to do anything about it. Very disconcerting, to say the least. Hope came with these words: “you knit me together in my mother’s womb.” I asked God to knit me together again, to knit me together in a new way, to be who he would have me to be. 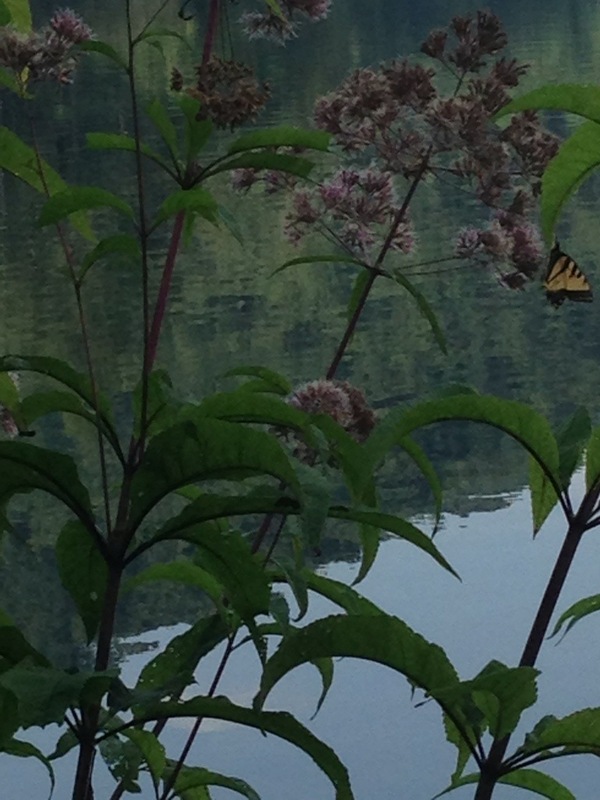 As I walked along the edge of the lake I encountered a golden butterfly in the midst of God’s magnificent creation. God does good work. All things are marvelously made. All things belong in the context of God’s story. This entry was posted in Christianity, faith, Grace, peace, Recovery and tagged holy ground, hope, inner darkness, inner growth, mercy, prayer walk, renewal. Bookmark the permalink. 6 Responses to Marvelously made. Thank you, Mother Beth. This speaks volumes to me today. I have moved to Flagler Beach and although all around me is God’s amazing creation, I find myself unraveling. As yet I don’t have a church home, but a new priest has been installed in the Episcopal Church in Palm Coast and I look forward to meeting with him and discerning my path. Until then I will make Psalm 139 my daily devotion and let it sink into my soul. There is much comfort to be had there.